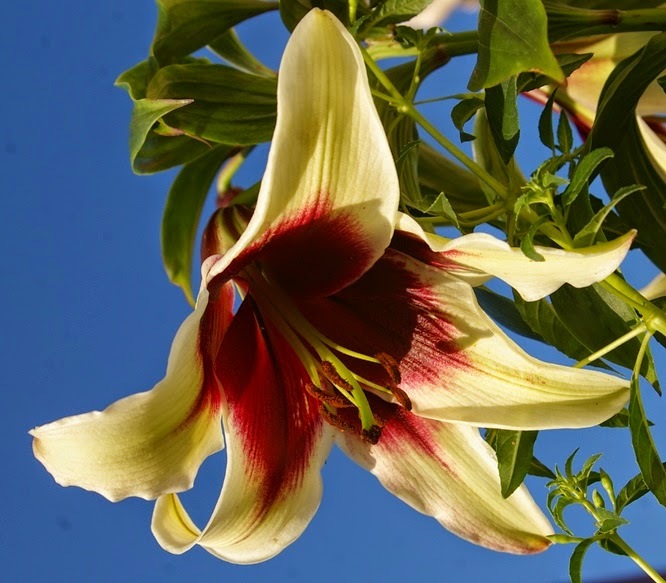 Lilium 'Kushi Maya' - a hybrid of L. nepalense, with a strong sweet scent. The perfect buttonhole rose: tight and upright on Saturday. Fully open and nodding, Sunday morning. When I visited Dublin last year Helen Dillon kindly gave me cuttings of a plant I'd been coveting for years, Rosa 'Louis XIV' - see the entry for 10 August 2013. They rooted well in a simple propagator on my windowsill, from which they were brought out in late winter before growth resumed. 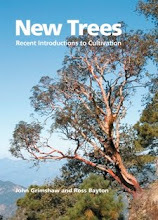 Not long after potting up in April a rabbit gave them a haircut, but this was probably beneficial, in that it encouraged branching from low down,. When growing well I put three into a large pot and these are now coming into flower. 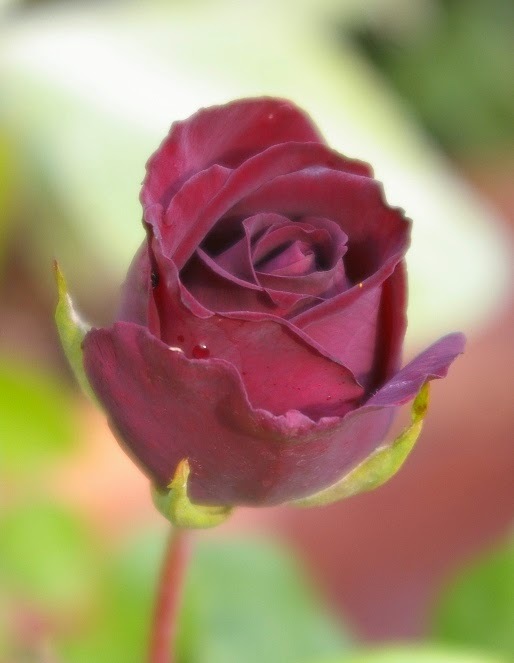 The first bud coloured-up last week and by Saturday was at its perfect best: a small, darkest black-red (the image is too light), classically shaped rosebud, held upright. I hope I shall have occasion to wear one as a buttonhole one day. 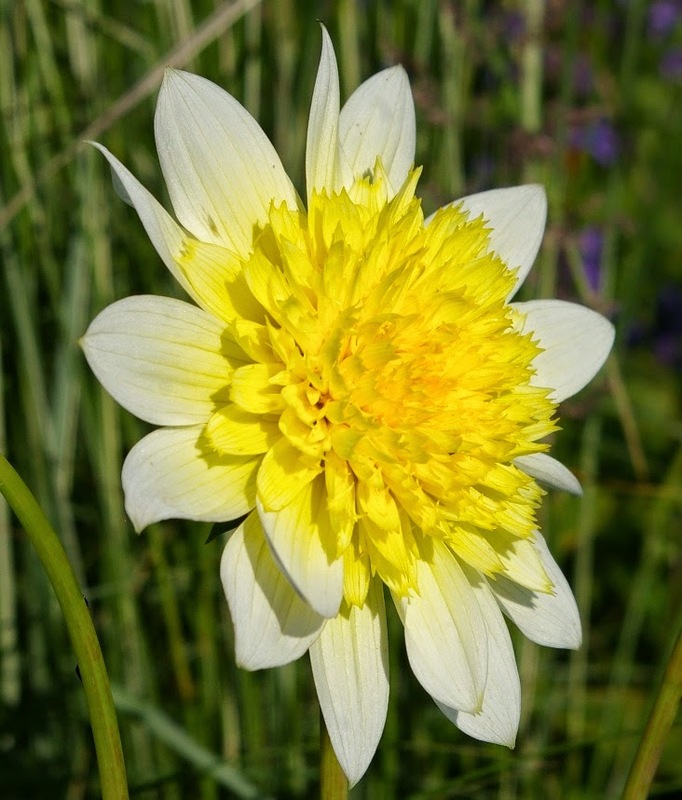 By the next morning, rather surprisingly, it had opened fully and was now nodding, a somewhat informally shaped flower with the outer petals slightly darker than the inner ones. 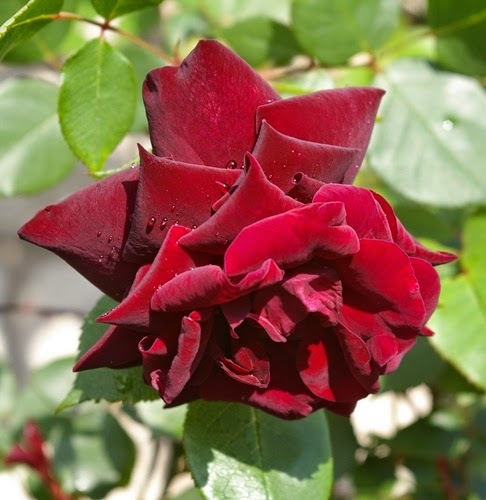 It was raised one of the Guillot family, a dynasty of French rose breeders, and introduced in 1859. It's classified as a China rose, probably because of the size and form of the short twiggy bushes, but to me it seems to fit better with the Tea roses, with its flower shape and classic Tea fragrance. It's pleasantly fragrant, but not exceptionally so. 'Louis XIV' has a poor reputation for health and constitution, but I'm told that it does well in the warm climate of the south of France. Vive le Roi! (though that is perhaps not the sentiment prescribed for Bastille Day). 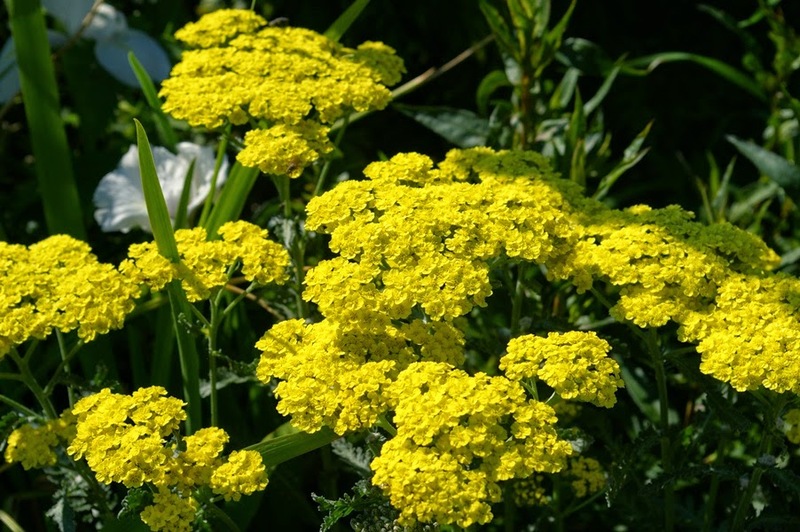 I find it very strange that 'Dora' is offered by only a couple of UK nurseries - it's a really good, long-flowering plant. 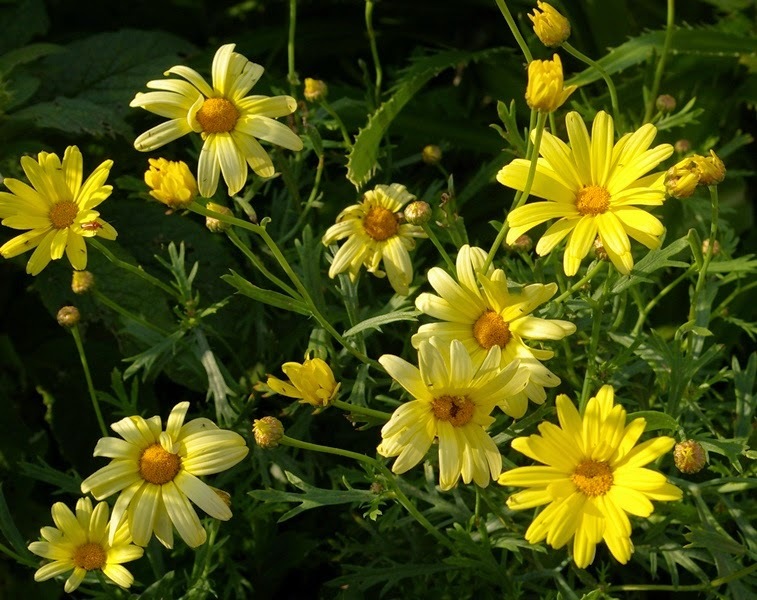 'Dora' is a useful front of border plant. The Settrington sheep have not been painted yellow. It seems improbable that anyone has failed to notice, but this weekend Yorkshire has hosted the Grand Départ of the Tour de France, with scenes of extraordinary enthusiasm all along the route. Le Tour Yorkshire didn't come close to here, and I had to be elsewhere this weekend anyway, but it was wonderful to watch the race unfurling through glorious scenery further west. 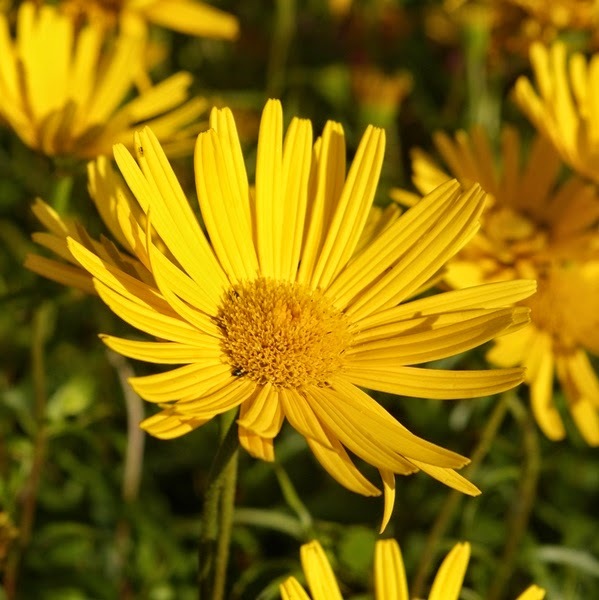 There have been all sorts of schemes for local participation, with gardeners being exhorted to 'plant Yorkshire yellow'. I am not altogether comfortable with yellow in my garden palette, so I haven't done anything different to normal, but here are a few yellow flowers from my garden this week - all composites, almost inevitably. 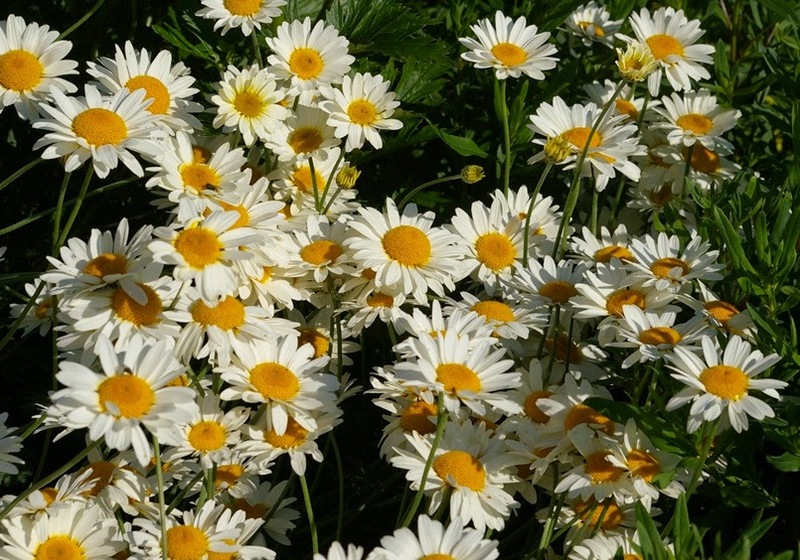 Argyranthemum 'Jamaica Primrose', the true plant at last. Dahlia 'Paso Doble'. It will be interesting to hear visitors' reactions to this one. 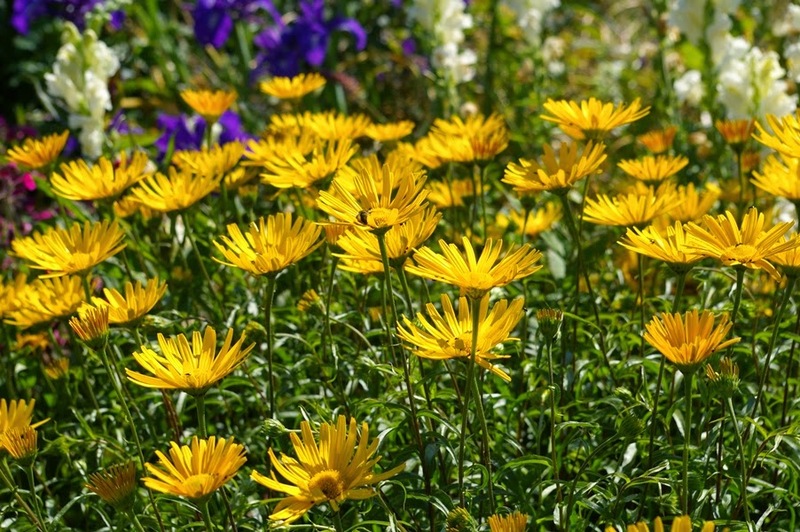 Hopefully the disc centres contribute sufficient yellow to count for this purpose: Anthemis 'Tinpenny Sparkle'. Since 2010 I've been growing a rather pretty alpine Campanula with mid-blue, white-centred flowers and hairy, conspicuously lobed and toothed leaves, under the name C. garganica 'W.H. Paine'. It's shown below. I have no note as to where it came from, rather carelessly. 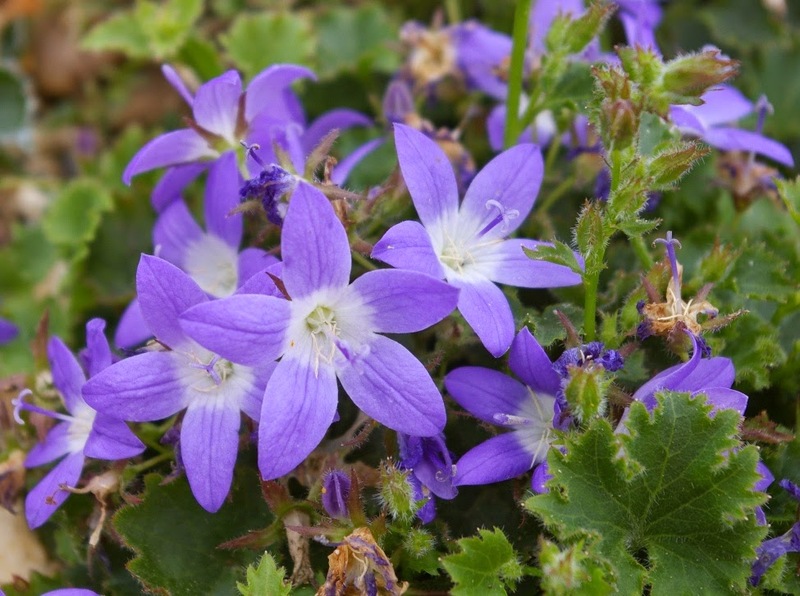 In the past few days a stunning, floriferous Campanula has come into flower, also in the sand bed (above). Its label also says C. garganica 'W.H. Paine' - which I picked up at Aberconwy Nursery last autumn, thinking it was just C. garganica (I didn't see the cultivar name on the label). So which is which? Google Images shows both under the name (plus various other spurious options). The Alpine Garden Society Encyclopaedia of Alpines only says that 'W.H. Paine' 'has richer-hued blooms' (compared with the 'blue with a white centre' of standard C. garganica). 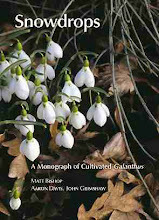 In Campanulas, A Gardener's Guide by Peter Lewis and Margaret Lynch the description says it 'has a striking white base to the rich violet corolla' (and that it originated in Ireland). 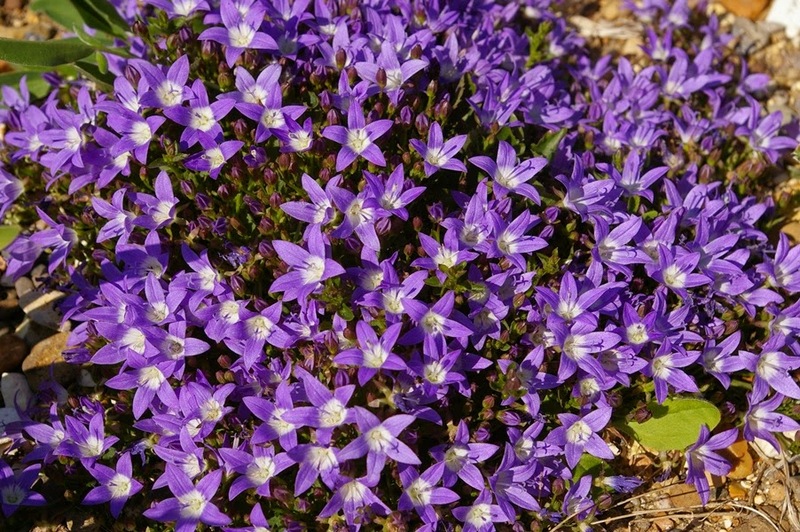 Graham Nicholls, in Dwarf Campanulas doesn't give much more of a description, but his photograph shows this plant exactly, and the comment that 'when well grown it can conceal all foliage beneath the flowers.' On the strength of this I'm satisfied that this plant is the true 'W.H. 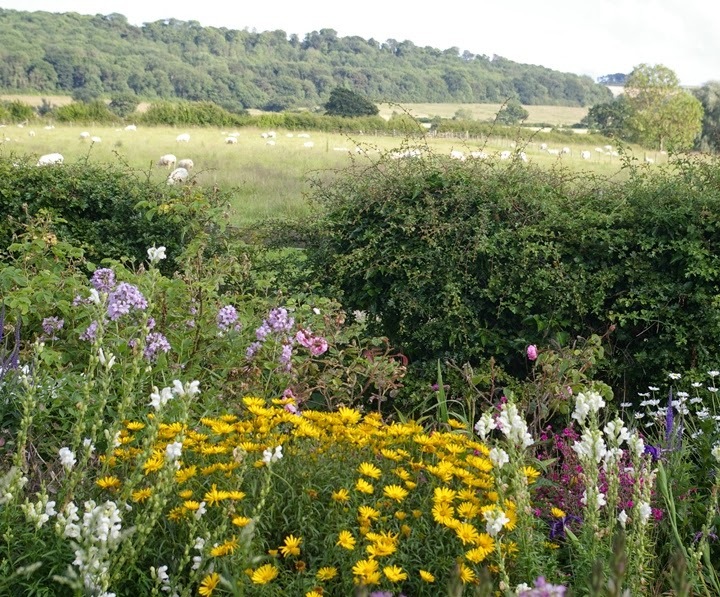 Paine', and it is indeed a beauty, deserving its Award of Garden Merit. The other one remains mysterious, not apparently fitting the description of any of the cultivars listed by these authors. It may be a form of C. garganica, but more probably a hybrid, possibly with C. poscharskyana (though it lacks the rampant vigour of that species). Suggestions are very welcome! So what do I call this?